The music is nice, too bad that there's only one effect. 17 mb? single colored 2048x2048 textures or wtf? :) whatever your excuse is (like engine bla bla), i don't like wasted millions of bytes. I did not succeed to remove all the cubes if that's what the goal is? If you comment out or remove lines 173 and 174 in prod.lua, you can control the camera rotation while the demo is running. If you don't want the demo to end when the music stops but want to experiment with the code and fly around the world, comment out or remove line 166 from prod.lua. Really cool concept. The realization is not the best, though. Maybe there's some technical stuff to impress fellow coders in there, but from an observer's perspective this is just vile and tacky. Thanks for the youtube video kn00tcn! And thank you very much for all the trouble you went to to artificially frame limit the demo on your system! There is indeed an assumption about the framerate in the camera rotation parameters. Because it "worked for me" on my modest hardware at Syntax, I didn't check that I set the engine to run potentially much faster (10ms per frame = up to 100fps!!!) 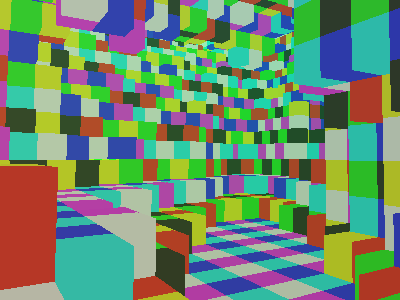 I should have made the frame rate controllable from lua. I'll add that right now. page created in 0.016322 seconds with 15 queries.